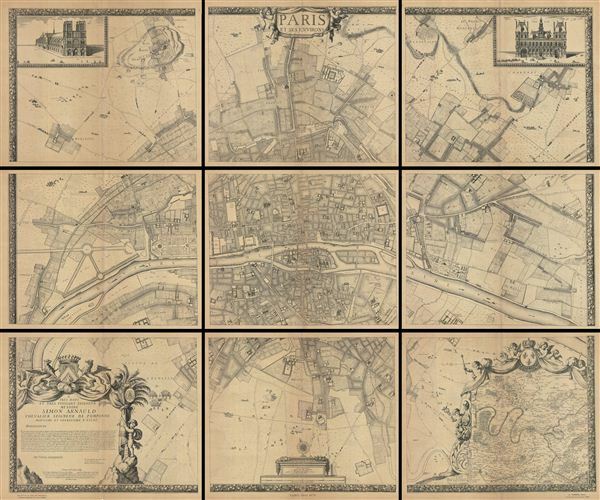 Monumental map of Paris in nine panels. A rare example of the c. 1900 reissue of Albert Jouvin de Rochefort's monumental 1675 nine panel map of Paris. Rochefort's plan of Paris was influential due to its illustration of the rapidly expanding urban center of Paris. This highly decorative chart shows most major streets with important buildings (and even farmers) rendered in profile. Vignettes in the upper left and right quadrants detail Notre Dame and the Hotel de Ville, respectively. A large decorative cartouche in the lower left quadrant includes a note from the author and a dedication to Simon Arnauld, a powerful French diplomat. Very good. Some toning on original fold lines. A couple of sheets have closed tears which have been repaired. Overall brittleness. Presented in original cardboard folio. In nine separate panels. Bibliothèque Historique de la Ville de Paris, A 132a. Boutier, Jean, Les Plans de Paris des origines (1493 à la fin du xviiie siècle) : études, carto-bibliographie, catalogue collectif, Paris, BNF, 2002, p. 187-189.